Though it runs over two and a half hours, Prisoners is relentlessly compelling in a cold, calculated procedural kind of way. Much of the film plays like the pilot episode of the next great TV crime thriller as it sets up the case of two missing girls and toggles itself between the families affected and the lead detective bent on finding the children. Unfortunately it’s that same sensibility that leads Aaron Guzikowski’s disappointingly rote and too-tidy script awry. We never really get to know the characters deeply as they are all composed of stock genre elements and would be better fleshed out in a long serial television format. Hugh Jackman is the everyman father willing to go rogue to find his little girl. Terrence Howard is the father a bit more composed and reluctant to bend the law. Viola Davis is the stoic matriarch willing to let the men settle this. Maria Bello is the mother who can’t even get out bed and is reduced to tears and pills. The older teenage children talk of running away from it all. And finally, Jake Gyllenhaal is the lonely, dedicated hard-edged detective (check out those tattoos) married to his job. We’ve seen variations of these characters before in similar thrillers. There’s nothing novel here. Even the suspects (including a child-like but creepy Paul Dano) are straight out of psych profiling 101. Oh, yes, and let’s not overlook Melissa Leo, batshit calm here, playing a rift on Melissa Leo. However, the actors playing these stock characters bring their A-game and traipse across Villeneuve’s crafty cinematic psychology with the appropriate gusto to hold the audience in rapture. Jackman has never been given this kind of free reign before, and his is an emotional and physical performance that echoes Mel Gibson in his Braveheart/Ransom heyday. 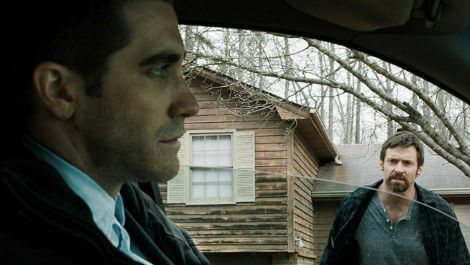 Gyllenhaal, with his blinking and brooding and chesire-cat smiles before getting rough with suspects, gives what might be his best performance yet. These two leads rise above the clichés of their roles by fully embracing the genre elements and using them as vehicles to deliver compelling performances. All along the way, Villeneuve pulls the strings with just the right amount of cool detachment. Though it grows a bit preposterous in its final act, and all the pieces of the puzzle fall too neatly into place, we’d be a cruel audience if we didn’t wince with suspense during a particularly harrowing race-against-time-car-careening-down-a-wet-highway climax. As grim as the tale is, Villeneuve knows we are all rooting for things to end well. We want to be tortured but then be rewarded with the warm and fuzzy. Sometimes though, it’s all just a game, and before getting that final catharsis, bastards like Villenueve know they can differentiate themselves by sounding a referee’s whistle…just…at…the…right…time. Game over. Fade to black. This entry was posted in Movie Reviews, Movies, Psychology and tagged Aaron Guzikowksi, Crime Dramas, Crime Thrillers, Denis Villeneuve, Hugh Jackman, Jake Gyllenhaal, Kidnapping, Maria Bello, Melissa Leo, Mysteries, Paul Dano, Police Procedural, Prisoners, Psychological Thrillers, Roger Deakins, Terrence Howard. As if being meta-aware, your review too ends with a jerk, shocker and imparts “that final catharsis”. Prakash – when you see the movie, it will add another layer of meaning to my closing lines. I haven’t seen Incendies, but I found Prisoners quite thrilling and an excellent study in the craft of pedantic scriptwriting. It was a tad bit overstretched in the end but it managed to impress me as a whole and the ride was worth it. Prisoners was a really good film until about the moment that snakes started crawling out of boxes. I blame Villenueve less than I do a pulpy script that gets extremely exasperating and improbable as it goes along. The tidy denouement also seems incredulous and far fetched. I guess the director can be blamed for not asking that the screenplay be edited to a satisfactory enough level. I never saw such a well made movie squandered on story developments that I knew were bad ideas in high school. Maurizio – yup yup yup. I’m starting to think Villenueve is like a Hitchcock-Haneke hybrid. He loves playing with the audience but he needs tighter scripts (his own for Incendies was even more preposterous than Prisoners – though it was based on a play apparently soooo maybe not all his fault). I get the giddy sense though, he has a great film in him – he just hasn’t found the right screenwriter yet.